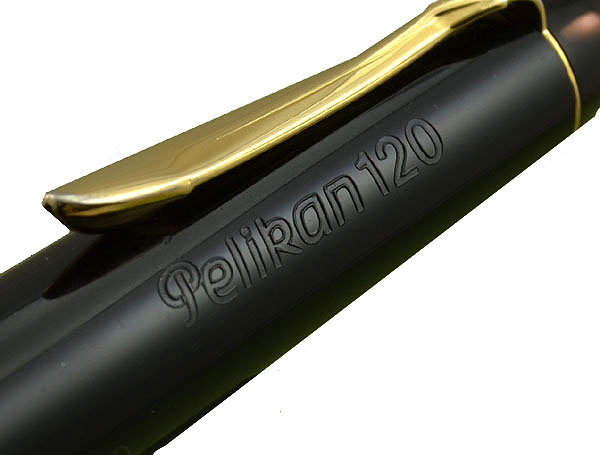 The Pelikan model 120 was introduced on May 23rd, 1955 and served as Pelikan’s first entry into the schulfüller or school fountain pen market. Prior to that, their focus had been on writing implements designed almost exclusively for adults. I spoke a bit about the 120 in my post discussing Merz & Krell, the company that briefly revived an updated version of the 120 line for Pelikan in the 1970’s. To be clear, in this post I’m only discussing the Type I 120 made from 1955-1965 and not Merz & Krell’s Type II produced from 1973-1977. 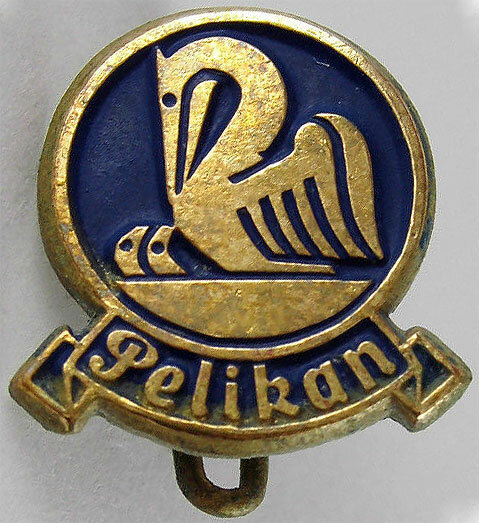 Pelikan was not the first to attempt to capitalize on this market segment and therefore had to play a bit of catch up in catering to these school aged consumers, their parents, and teachers. School pens generally follow certain guidelines, incorporating characteristics that can be seen across school pen models, even those from different manufacturers. At least initially these were available in only basic colors, lacked ornate furniture, and usually came equipped with a stainless steel nib. 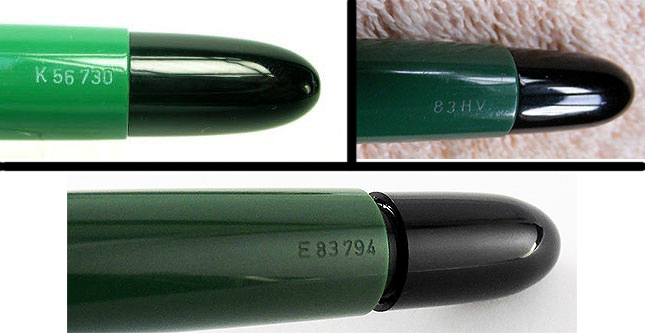 In the case of the 120 Type I, they were only offered with a green barrel, black cap & piston knob, a green ink window, and a gold-plated stainless steel nib married to Pelikan’s ebonite feed with the longitudinal fins. All 120s were piston fillers, a contrast to the later school pen models which were almost exclusively cartridge pens. Astute owners have noticed that there is a string of letters & numbers running longitudinally along the barrel of many 120s, near the piston knob. Short strings of characters like the ones illustrated in this post (K56730, E83794, 83HV) have caused a degree of consternation amongst users regarding what these numbers might signify. They are not serial numbers as one might expect and are not present on all 120’s. What they in fact are is a progressive numbering system utilized so that the school children could identify which fountain pen was theirs without any confusion. You can imagine how this would be practical in a school setting where many of the students may have the same pen. There was only one color scheme and design so there really was no other way to uniquely identify and establish ownership of the pens. The longer, six character strings seem to be more common with a letter preceding numbers making the depicted ’83HV’ engraving somewhat of an outlier though this too was likely a code engraved for identification purposes. Pelikan actually utilized this coding system as a selling point and, in 1958, they launched an advertising campaign built around this feature. In fact, parents/children who notified the company of the serial number were given a gold & blue colored badge or pin. I encountered a resident of the Netherlands who informed me that, at least in his country, these were available in stores until 1967. A badge identical to the one from the Netherlands is depicted below and while I’m not certain that this was the badge offered in the actual campaign, I suspect that it was. After five years of experience in the school pen market, Pelikan began production of the first Pelikano model which was launched on March 22, 1960. Pelikan based the Pelikano’s design on lessons learned from the 120 as well as the feedback they received from teachers. This gave birth to a very successful and lasting line of school pens for Pelikan which persist to this day. Wow! Very nice article. I did not know that the 120 was the “pre Pelicano” school pen and always wonder whats was that serial number on the barrel. thank you very much for your page. It is really awesome. You’re welcome Pablo. I think that serial number has been a mystery to many so I’m glad to shed some light on the issue.